The need to belong is met by having a place where you can be yourself, in all the struggles that entails. A place where you can be accepted as you share and deal with feelings, needs, desire, longings, and hope. 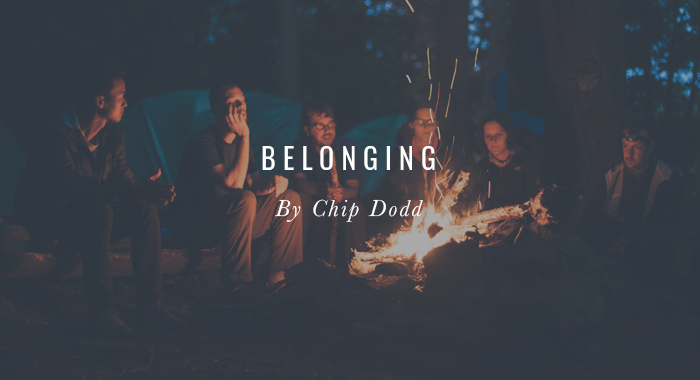 You belong when you know that you can be celebrated in joyful times and grieved over in times of loss. Belonging affirms your worth as a person. The need to matter is met through being appreciated for your own individual giftedness—what is born into us, and is developed. The gifts are an active expression of what you naturally are drawn to and desire to share. We all desire others to notice and appreciate what we are good at doing and enjoy. But the gifts, their development, and performing in your gifts never become your worth. The need to matter is met through being appreciated for your own individual giftedness. If the need to belong is not met first, the need to matter can become confusing. 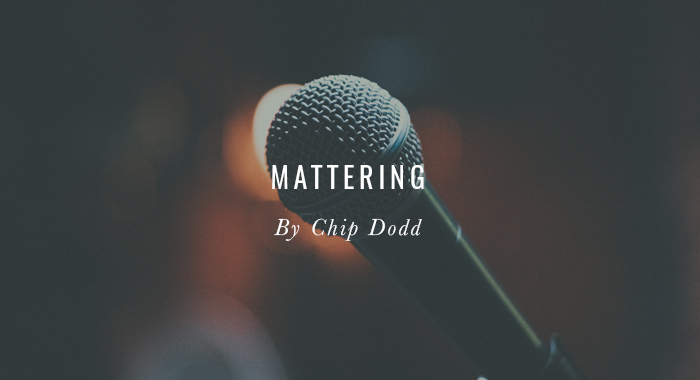 The need to matter can become a performance-driven sense of worth. It can become a way to earn belonging through achievement, approval seeking, and people pleasing. In other words, your worth becomes as valuable as your last performance. That mistaken belief can create a roller coaster of desperation. If the need to belong is not met first, the need to matter can become a performance-driven sense of worth. His son was offered a full scholarship to play a Division-1 college sport. During the coach’s recruitment spiel, he told the son, “The only thing that matters to me is the number on your back and your stats. I’m a fair coach.” After the meeting, the son said, “Not interested. That is not enough.” He went on to take a scholarship at a “lesser” school, one that had a coach that talked about development as a person and then a player. The son knew he could belong in that program, and the performance of his gifts would be an extension of that belonging. He would be a person first, then a producer. That man’s son went on to play professionally, and attributed much of his success to the coach that loved him first, and then appreciated his stats. Even during an extended period of injury, the son didn’t live in fear of not mattering because he belonged first. The son was under no illusions about how sports or life work—we have to perform—but the father had raised the son to know the difference. After the son’s career as a player ended, he still had a future to live, not just a past to remember. He has been doing so as a successful coach, teaching personal development first, and then the game. His players still come back to see him, and he knows their names. They matter to him. For further reading, check out The Needs of the Heart, by Chip Dodd. Available here on Amazon. Ayeka is an ancient Hebrew word that is still used in daily life today. It means, “Where are you?” It is used today when a person, parent, friend, compatriot wants to know about your inner-world, the heart experience of you. It is a question spoken towards someone who has become emotionally removed, distant, unknown, or even secretive, and it is a question of invitation spoken from one who loves and reaches to have reunion of heart. Ayeka assumes loneliness, missing, heartache, and concern from the speaker who seeks to hear from the heart of the one being questioned. As a word of pain, it expresses a groan or lament towards another. The one who asks the question has heartache, and has a hunger to be close again. Ayeka laments, “You are lost to me and need to be found by me because my heart aches with missing you, wondering about you, craving to see you from the inside out. It is a question that seeks a renewal of intimacy. There are times when Sonya asks me, “Where are you?” even when I’m sitting beside her. She obviously can see me. What she wants to know is what is going on inside of me, what preoccupies my heart, has removed me from her. I might ask the same of her when she seems to be emotionally removed or distant. It is a caring courageous question of love. In Genesis 3:9, the word ayeka is used when God speaks to Adam. God is not asking about Adam’s physical position. God knows that Adam has removed himself emotionally and spiritually. “Where are you?” in Genesis 3:9 is a groan, a lamentation of God who loves and knows that his created ones, his people, have removed themselves from how they were created to live. We are continually called and created to live in relationship—from the inside out. Adam answers the question as it was meant. He speaks from the heart: “I was afraid because I was naked; so I hid.” Adam had removed himself from whom he was created to be, connected in heart to God. God wanted him back. Proof is in God’s response when Adam spoke the truth of his heart. After he revealed the truth that God already knew, a relationship begins again. The long road to redemption that is in Jesus began that day. And today, ayeka is still spoken by God to us, all the time, calling us to show up in relationship of heart with God, and others, by telling the truth about ourselves. We are not created to remove ourselves from relationship, to do life alone, in our own self-sufficiency, false independence or technological “intimacy”. We are continually called and created to live in relationship—from the inside out. We are called to speak the language we were created to use, so that we would not be trapped by isolation, cursed by apathy, or abandon ourselves to secretiveness. God is beautiful and good, always and forever seeking us out, willing to groan as an expression of never giving up on how he created us to live in relationship. Our response-ability is to use the courage we were created with—we can surrender to the one who created us to answer the question. We can also use that courage to ask the question, ayeka, of others. Ayeka, where are you? God wants to know. Your loved ones want to know. Let us not live without the answer. Let us continue to return to the language of the heart, the language God created us to speak. In so doing, we can live in the intimacy of continual reconciliation with God and the others who hunger to know us. We can live in the intimacy of continual reconciliation with God and the others who hunger to know us.